On May 29th 2015, the European Union Advisory Mission ‪conducted the Monthly Panel Discussions on the Civilian Security Sector Reform in Ukraine focused on Decentralization, Constitutional Amendments and their Impact on the Rule of Law in Ukraine. The Deputy Head of Mission Mr. Hugues Fantou hosted the Discussion, which is a one of the EUAM’s underline regular organization efforts to exchange experiences and opinions with Ukrainian authorities, civil society representatives and international organizations. “Decentralization considers all governmental bodies and Police is one of them. In France and Germany, we have successful examples of Municipal Police, which is more connected to local problems. Ukrainians can also benefit from Municipal Police in order to get better service and contact. It is on the streets, markets, near schools in closer relations with the population. However, if something disturbs the public order, the Municipal Police directly contacts the National Police. They are the “eyes and ears” of the National Police”, underlined Alain Scolan. The same standards for Municipal Police should be provided in every ‘oblast’ despite volume of the regional budget as well as the legal framework for clear delineation of tasks with the National Police. “It is an obvious benefit for all Police because it will allow to concentrate and to specialize on certain tasks, to be more focused. 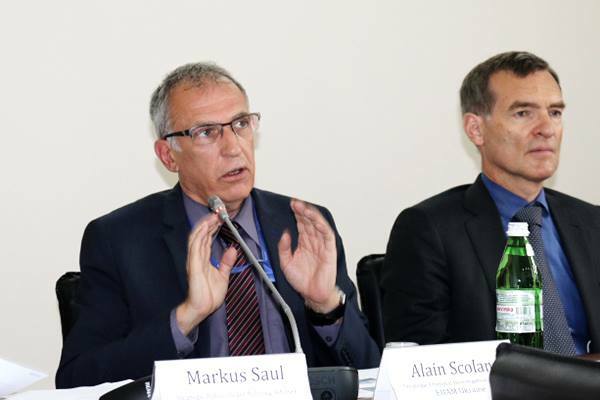 Municipal Police, which is consisted form the local staff, can be closer to a community and cope with problems on the spot”, said Markus Saul. Ihor Koliushko, the Member of Parliament, Chairman of the Board of the Center for Political and Legal Reforms continued the discussion with presentation on “Decentralization, Constitutional Amendments and Reform of Law Enforcement”. He outlined the need for the Municipal Police and different opinions as for its functions in the Ukrainian society. “Some stress concern over Municipal Police functions as they can perform as armed battalions of Ukrainian mayors. Some claim that the Municipal Police should not be subordinated to the National Police and carry duties only as unarmed guards. The Law on National Police (adopted in first reading by Parliament) doesn’t consider decentralization in general. Plus there is another draft law in parliament on Municipal Guards which doesn’t put in line the functions of this body in line with the National Police”, concluded Ihor Koliushko.